Etta James and Johnny Otis — Jazz Masters? Etta James, who died today Jan. 20 at age 73, and Johnny Otis, who died Jan. 17 at 90, are rightly recognized as innovators and icons of American rhythm ‘n’ blues and soul. But the jazz world — listeners, broadcasters and journalists, musicians and institutions up to and including the NEA — would be well-served to proclaim that Etta James and Johnny Otis are “jazz masters.” Their sub-genre identities remain within the greater mainstream of Afro-American music born about a hundred years ago, with blues becoming ever less a so-called “folk” form by engaging with other musical and commercial influences, leaving rural isolation for urban hubbub, diverse developments and the ear of the world. Furthermore, Otis’s and James’s specific sounds emerged from America’s unique swing era stylings, in response to and generation of post-WW II U.S. cultural norms. As one with jazz. Why would it matter if we called Otis and James “jazz masters”? It would emphasize the structural girding jazz has provided for the past century to all of American popular song. So pop audiences would be encouraged to recast their “jazz as dead” stereotype, comforting current jazz artists who complain they can’t make it ’cause their music is chained to the “n-word”. Indeed, such jazz musicians might learn something from Otis’ business sense and James’ dismal history. If we don’t recognize people like Otis and James on some official level as jazz masters, then as what? Heritage artists? That designation has been coded to mean ultra-traditionalists and conservationists. Nothing wrong with that — but Otis and James were more involved with updates, revisions, hybrids, popularizations and other pragmatics of music-making than in revering its glories or protecting its legacies. They’ve been inducted into the Rock and Roll Hall of Fame and the Blues Hall of Fame — fine and good, such recognition and honors for their links to jazz aren’t mutually exclusive. It’s beneficial to admit that categories aren’t rigid. Clarence “Gatemouth” Brown was a jazzman, too. Johnny Otis and Etta James were jazz musicians from the start — jazz was their inspiration. Understanding them as such provides us with a truer vision of the breadth of jazz and its manifestations. It also prods us to enjoy their music in more depth, to take in its subtleties and appreciate the art. 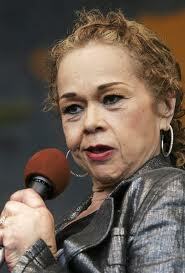 Etta James wanted to be Billie Holiday. Holiday’s influence is palpable in all of James’ ballad singing, including her version of “At Last” (originally recorded by Glenn Miller and his orchestra) — it’s in the way Etta phrases, hesitating behind or jumping ahead of the beat, how she wrings lyrics for layers of meaning and employs all the qualities of her voice despite a fairy limited octave range for nuance. James won a Grammy for Mystery Lady: The Songs of Billie Holiday, and in her 2006 album All The Way she’s as credible with that Sinatra signature song as with Lennon’s “Imagine” and “What’s Goin’ On?” That’s a jazz artist’s adaptability. And though it was rare for her to record with swing-oriented backup, though she shouted out upbeat messages with gospel fervor rather than float through melodies like a horn, Etta James could improvise just fine, as when she joined Glady Knight and Chaka Khan, backed by B.B. King, in the Bessie Smith classic “T’aint Nobody’s Business,” which Billie Holiday also sang. Otis and James were musicians who projected no pretense of performing high art, experimenting or abstracting. They were on-the-road entertainers who, if they lacked probing and profound repertoire yet depended upon consistently performing real live music people would flock to and pay for night after night, everywhere, in pursuit of being made more relaxed, happier, less blue — transformed. Otis, in particular, was alert to trends in taste and the talented people who could fulfill listeners’ desires, and discovered several singers including Etta James but also Esther Phillips who brought jazz-derived edge to bluesy pop material. James was a balladeer for the working class, never very glamorous, often in her early work raunchy or a victim, but touching because she put emotions in her voice that rang so true. Johnny Otis and Etta James may have ended up as the Godfather of R&B and the First Mama of Funky Stuff, but when they started those categories didn’t exist. They toiled in the fields of popular jazz. That they affected change in popular music coming from such background and never dishonoring it means, to me, they were masterful enough to focus elements of the jazz arts into music of wide appeal, gathering audiences from across formerly divided demographic groups, turning definitions that hewed to conventions on their head. Let me be clear: I am not suggesting that the National Endowment of the Arts issue posthumous honors holding up Johnny Otis and/or Etta James as embodiments of jazz originality or virtuosity. But I do submit that popular artists who employ jazz strategies, techniques, tactics, materials and values are also part of the jazz spectrum – as today the jazz industry (what’s left of it) and press (ditto) includes under the greater jazz umbrella, sometimes grudgingly, Kenny G., Boney James, Najee, Soul Live, Diana Krall, Tony Bennett, Jamie Cullum and countless others. If we don’t, maybe we should. Because counting their sales boosts the bottom line on overall interest in jazz, and makes a mockery which is well-deserved of definitions which only have to do with marketing. Because playing them in a jazz radio show demonstrates the connections between the earthy and the esoteric. Because music is a stylistic continuum, and not series of separate bins. If it’s vernacular music made in America since the 1920s, derived from African-American traditions and urban circumstances, engaging primarily with the marketplace rather than the academy or conservatory, depending upon knowledgable musicians to make it good in real time — then I say it’s fair to call it or at least reasonable to say it’s been informed by “jazz.” Whether you agree or not, please hail Johnny Otis and Etta James, find some of their music to listen to and dig. Yes, Howard, yes. 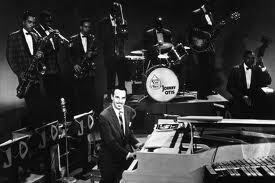 If not for you, I would not have known of the passing of Johnny Otis, so thank you for that too. They both are part of the Jazz tradition,expand the horizons and ears of music listeners, especially, I think, young people who may not have known about a music called Jazz. Or at least they did when many of us were young, or younger people. Don’t forget such works as Johnny Otis’ early hit version of “Harlem Nocturne.” To me, the strong link between jazz and blues/R&B is epitomized in your statement “The distance between mainstream jazz (if not that new thing, “bebop”) and pop music for dancing was quite close then. Benny Goodman, Artie Shaw, Tommy Dorsey, Billy Eckstine, Tommy Dorsey, Bob Wills, Ella Fitzgerald, Big Joe Turner and Louis Jordan were among the genuinely popular stars of jazz.” Thanks. Quite right, Martin. “Harlem Nocturne” is an interesting example of a crossover jazz instrumental. No evident improvisation, a lot of vibrato in the alto sax lead (not generally fashionable, but good enough back in the day for Sidney Bechet), maybe a hint of “Spanish tinge” yet little explicit “ethnic” or “exotic” air to the melody and arrangement — and this couldn’t and wouldn’t be considered anything but “jazz.” There are to my knowledge only a couple handfuls of jazz-associated instrumentals after WWII that had this kind of crossover hit success. Perez Prado’s “Cherry Pink and Apple Blossom White,” Al Hirt’s “Java”, “In Crown” by Ramsey Lewis, Henry Mancini’s themes to “Peter Gunn,” “The Pink Panther” and “A Shot in the Dark,” a couple of the Herb Alpert Tijuana Brass songs (I like “The Taste of Honey” best), “Tequila” by The Champs, The Ventures’ “Telstar” and “Pipeline” and “Wipe Out”, Cannonball and Zawinul’s “Mercy, Mercy, Mercy” and maybe the last of them would be Grover Washington Jr.’s “Mister Magic.” Has there been a jazz-related instrumental that crossed over, radio-playlist-wise, in the past 30 years? Did David Sanborn have a single big hit? I guess Kenny G’s “Songbird” would qualify (sorry about that). Thanks for the well written story.. 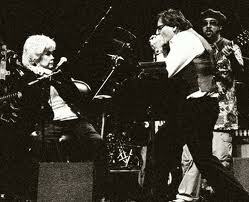 I loved both of them.. Mr. Johnny Otis from as a kid listened to him on the radio and later his TV show.. and Etta ? Wow, what can one say about this talented amazing lady? I loved her from the time I first heard her and a version of “Work With Me Henry” that at the time our local radio station would not play…….. She was awesome and Johnny intorduced a lot of white people to jazz that had never heard it, at least not the way he and his band did it.. along with introducing Hank Ballard, Big Mama Thornton.. etc..
My pleasure, Jackie, to have heard and resonated with this music. A real pleasure to read such a well written article by a writer so well versed in jazz. to like it. Of course everybody has their own opinion about what would help jazz survive. Upon discussion, the subject always becomes convoluted then futile. Being a jazz musician all my life, I have observed young people listening to and watching jazz. They dig it !! It’s just that they don’t really ever hear it in the right context or at all. “Jazz is like fine wine” if you know nothing about it. you won’t know the difference between a 60 bottle or a 10 dollar bottle. In otherwords, we need to educate our youth about amercan culture. I believe this would go along way in helping to preserve jazz. Other countries go to great lengths to preserve thier own culture but we don’t. The digital revolution and all associated computer driven music has pushed it even futher away. Our government, record companies & radio stations are huge contributors also. Never the less, the bottom line is: “We need to teach our youth about jazz”. It would go along way…. 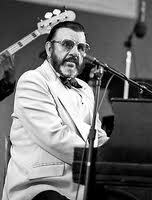 Thanks Morrie — indeed, the jazz education movement is one of the bright spots of the current US jazz ecology. Jazz ed. shouldn’t be limited to musical training, however — I think it should be a reference point for liberal arts studies of American culture, too. But beyond the school-like education is daily accessibility *for fun*. Instruments ought to be available for young people to fool around with. Mentors should make themselves available. The music might be programmed in public spaces at low cost. Jazz ought to be recognized as part of our national language. The timing, of course, would have to be impeccable. Nominating them right away – altho nobody’s saying let’s do that – sends 2 very negative messages. 1) The most significant thing a jazz artist can do in today’s culture is to die. 2) An artist’s contribution is best recognized after they are no longer contributing. Paul, a Jazz Master is stipulated to have to be living. Andrew Hill was informed of his acceptance just before he died, and I believe Luther Thompson died prior to receiving his Award. Also, I’m a bit older than you and I had a flute lesson tonight (from the excellent Jamie Baum).